There's just over a week to go until the big day: still plenty of time, although it might not feel it. If ideas for that special something for that special someone are stubbornly refusing to arrive, there's plenty of advice online. The Guardian has a handy list of ethical pressies, which sensibly include our friends at the Fair Corp and their brilliant Ethletic shoes. They have their own Christmas shop too! I'm not convinced about the Lego cufflinks, mind. Lego should be played with, not worn, and it's tough enough to be rolled into collections that should last for generations of kids. Talking of recycling, the Telegraph takes the high ground by recommending gifts that you can either make yourself, or are made from recycled material. They tag a rather smart range of belts by Velo-re, made from old bicycle inner tubes. The make your own aesthetic is one that's worth resurrecting. Knitwear's getting cool again, and a nice pair of chunky home-made mittens would go down a treat. Of course, there's always the Ethical Superstore, who have a huge of goodies to match every budget and taste. They're taking express orders up to the 22nd, so you have a bit of time to make up your mind yet. As for us... Pier 32 is closing up on Wednesday the 21st, and back up for business on January 4th. The blog will be updating, although probably at a reduced level, dependent on whether I can hoick the laptop onto my turkey-engorged belly. From all of us at the Pier to all of you, have a happy Christmas and great 2012! It's nearly six months to the day since Guru Ian first asked if I fancied writing for the Pier 32 blog. As today also happens to be my 39th (ahem) birthday, it's nice to note that the gang have clubbed together to mark the occasions with a rather nice gift for me. It's a Stormtech jacket, made to exacting WRAP certification that ensures it's been sourced and put together in a fair and ethical way. Stormtech are a Canadian company, and therefore know their winterwear. The jacket is waterproof yet light and breathable, and stuffed with clever features and touches. I'm still not sure that I've found all the pockets. It's proven its worth already, as a cycle home in some pretty impressive storm conditions last night soaked my jeans and boots but left my top half bone-dry and warm. Ian thinks you could go ski-ing in the thing. I have to take his word for it; I barely have the co-ordination to walk in a straight line, let alone slide down a mountain with sticks on my feet. I wouldn't normally choose a coat like this, but in use the Stormtech has done the business. I'm a convert to the cause. Check out the Stormtech range over on the Pier 32 website, and make sure you, your clients and your team stay snug this winter. I talk a lot on this blog about how customer power is leading the slow but inexorable shift towards a greener, more sustainable high street. But that's only half the story. Retailers need to be on board, as well--and it seems, they need to be one step ahead of their customer's wishes. At a conference last month hosted by The Start Initiative, a charity to promote sustainable living chaired by Prince Charles, the problems and challenges faced by retailers in this new arena were thrown into sharp relief. Large brands like Asda and M&S are reporting that their customers are looking for information on sustainable products. But at the same time they're expecting the stores to lead the way. This kind of public information, which until recently would have been seen as a government responsibility, is more likely these days to be dealt with by the retail sector. Whatever we think of that shift in educational focus, it's an opportunity for switched-on brands to show their customers that they share values and concerns. The trick is how you introduce and present yourself. Come across as preachy or worse, fake, and there's trouble in store. The key, it seems, is a soft touch, allowing change to emerge slowly. "The key is to be one step ahead of the customer, not two. Otherwise they won't come with you." Baby steps, then. Plan A is a good example of this, as most of the changes M&S are making to create a sustainable business model are taking place behind the scenes, and over a five year period. Clever ways of getting the customer to adopt new ways of thinking towards their purchases have benefits for everyone. For example, the M&S partnership with Oxfam, where donated clothes trigger a discount voucher, keeps the brand and it's values in the customers mind, sparks a return visit to the store and keeps perfectly good clothes out of landfill. The green High Street is still a long way off. But it's great to see big-name brands taking the challenge seriously, and helping to lead the way. More on the Start Conference over at the Guardian. America's probably not the first place you think of when you're looking for a company that deals in sustainable clothing. That's why it's such a delight to see the success of SustainU, an American apparel chain that uses completely recycled fabrics. SustainU clothes are made from fabric produced from post-consumer plastic bottles, recycled cotton and post-industrial textile waste. They're printed and embellished of them with eco-friendly, PVC and phthalate-free ink. The clothes are kind to the environment, and kinda cool, too. More than that, they're fighting to bring jobs back to the moribund American clothing manufacturing industry. Based in Morganstown, West Virginia, SustainU make their clothes exclusively in factories in North and South Carolina and Tennessee, helping families in some of the most poverty-stricken areas of the USA to restore some manner of pride. Thinking locally has other positive impacts. From start to finish, their products take less than a 200 mile radius of transport to create yarn, knit the fabric, and cut and sew the clothes. By cutting out cross-country travel (and indeed the intercontinental shipping that most big clothing companies take for granted) , SustainU are cutting their transport and fuel bills off at the knee. SustainU's message is getting across, too. Chris Yura, the CEO of the company was recently cited as a Champion Of Change by the White House, and he was one of the business leaders invited to a recent forum concentrating on ways of getting American manufacturing back on it's feet. As they expand into the retail market, it'll be interesting to see how Chris carries the strong, positive message of his company into the more mainstream market. SustainU are doing all the right things in all the right ways, and we at Pier 32 applaud them for their forward thinking and belief in the power of locally-sourced, globally minded clothing. Lots more to read at the SustainU website. Go see. Zero waste is the holy grail for any green manufacturer. Everything that you produce gets rolled back into the system somehow, and waste management becomes a real exercise in creative thinking. It's a tricky thing to get right, of course, and a slow process. But you can see the delight, almost the sense of play in trying out different tactics. Witness, then, the Zero Waste Anorak. Loomstate Organic teamed up with Parsons The New School for Design, and graduate design student Andria Crescioni to create a garment that teams an unstructured charm with a cutting-edge approach to sustainability. The anorak was made entirely with factory scraps, from the soft jersey fabric to the leather detailing. It's a very limited production run, admittedly. But as proof of concept and an example of what can be done with creative thinking, it's worthy of applause. You can read more about the Zero Waste Anorak at Loomstate's site, where it's also available to buy. Might be worth getting your mitts on this one. It could be a real collector's item. Gerry, the Voice (and many would say the conscience) of Pier 32 pointed me at an article last week that filled me with both anger and sadness. A wave of suicides amongst Indian famers has seen over a quarter of a million deaths in the last 16 years, mostly in the fast rising market for cotton. The farmers take out huge loans for hybrid seeds, which are sold to them as fast-growing and high yield. Unfortunately, these seeds are unsuited to the harsh Indian climate, and give poor returns or even fail entirely. Faced with a debt they cannot pay, the farmers take the only way out they see left to them. In the ethical market we can claim great gains and progress in fairly traded products, ensuring that our producers get a fair wage. But in the mass market this protection is still in it's early stages, and hundreds and thousands of people are falling through the gaps. This isn't a problem that's exclusive to the textile and clothing industry, of course--Chinese factories producing goods for the computing market have had spates of suicides that led to some buildings sprouting nets to catch depressed workers who were flinging themselves off the roof. Our voracious hunger for cheap clothes has led to a globalised market that cares little for the people at the sharp end of the process. Big agricultural companies will happily sell seeds to farmers without asking the right questions about the land in which they're to be planted. Textile companies will always avoid unpleasant questions about the source of their cotton. Clothing manufacturers are slowly learning to look back through their supply chain and look out for blatant abuse. But short of a ban on hybrid crops in India and a significant increase in education on what crops can work in any given terrain, there will always be tragedies. I'd love to say that there's something that we as consumers can do to help the situation, but I can't see what that might be. It's a symptom of unchecked and unregulated globalisation, a storm of unkept promises and lies that's leaving the farms of India without farmers. When the only thing these farms are producing are widows, it's certain that something has gone badly wrong. If you can bear it, Yahoo News has more. There are those amongst you that could accuse me of being more enthusiastic about footwear than is entirely healthy. I can't help myself. I am a man with well-defined and esoteric tastes. It doesn't help that that the vast and all-seeing net of bots and spies at my command keeps coming up with links to brilliant and innovative companies like Po-Zu. They are a British brand that launched in 2006 with two shoes, a kind of outdoor slipper for men and women. Since then, the range has exploded to include wellies and proper boots for stomping through misty English woodland. And something that looks like an Ugg boot for men. Not sure about that one. Po-Zu are ethically sound, of course. Founder Sven Segal was inspired by the cradle-to-cradle ideas of William McDonough & Michael Braungart, and the shoes reflect that philosophy. The shoes have ethically produced latex rubber soles and all the materials involved, incuding the boxes they come in, are biodegradable. You can bury your shoes in your garden at the end of their life. Po-Zu's USP is a coir "foot-mattress" in each shoe that moulds itself to your foot, ensuring an incredibly comfortable fit. I'm seriously impressed by the huge range in their online shop. There's a style on offer for most walks of life, if you'll excuse the pun. FINE, OK, they don't just do shoes. Accessories include laptop bags and backpacks, and a shoe cream made from coconut that you can use as a moisturiser and lip balm. You could even, if the urge struck you, eat the stuff. The site is full of great ideas and products. Po-Zu have a clever approach to retail, a light and funny touch that's somehow endearing. Their smart design has led to collaborations with Timberland and Maharishi, and I have the feeling we'll see more from these guys in the future. They're quite genuinely a step ahead. Read more on the Po-Zu website, and check out this interview with founder Sven Segal on Planet Green. At Pier32, we understand that our customers are a discerning and fashionable bunch. We also understand that they don't come in one uniform shape or size. So why should our promotional clothing be like that? In the latest Pier32 mailout, we look at how we make sure that, when you order a load of shirts from us, we'll do our utmost to make sure everyone gets the best fit available. There's no need for everyone involved in your promotional or fundraising event to wear the same shape of garment. And there's no extra charge for that, either! You know of course that our ranges are ethical and fashionable. We stock a massive range of clothing from manufacturers like Continental, Earth Positive and B&C Collection that wouldn't look out of place on the high street. Smart, durable and responsible. You can't really say fairer than that, can you? There's more on this week's initiatives, and all sorts of other gems from the Pier if you subscribe to our newsletter. Just visit the Pier32 website for more information on how to join our informed and responsible community. While we're on the subject of the web, just a quick heads-up on a friend of the Pier. The Fair Corp, home of this blogger's favourite footwear, Ethlethic shoes, has just rolled out a brand new website. It's full of news, offers and interviews with the farmers and workers who help to make Ethletic such a smart brand. Go visit, and tell em The Pier sent you! Change is a funny thing. When you're not expecting it, it can be on you like an express train. When you're looking for it, it's more like the slow stopping service, grinding towards you at a snail's pace, stopping at every third lamp-post. For those of us that want to see a more responsible, ethical fashion industry, the pace of change can be frustratingly slow. The Ethical Consumer notes in their latest shopping guide that the average UK female buys half her bodyweight in clothes this year, and owns four times as many garments as she did in 1980. Meanwhile, despite campaigns and increased public awareness, sweated and forced labour around the world seems to be growing to meet that voracious demand. It can look like the train is stuck a long way down the line. Meanwhile, recent revelations about the use of forced child labour in the cotton industry in Uzbekistan has led to big UK brands like Asda and global names like Adidas and H&M declaring an outright ban on the use of fabric from the region. Add to this big results like the action taken to safeguard Chinese rivers following Greenpeace's exposure of pollution by textile plants, and the future starts to look a bit more rosy. But we need to keep an eye on the manufacturers, who have a spotty history of responsible behaviour. Use of PVC by clothing brands had died off following a spate of publicity about its toxicity. Now, bizarrely, companies like H&M have started using it again. "We know from experience that clothing companies will respond to consumer feedback which is why it's vital that shoppers keep up the pressure on companies to improve their ethical standards." We are more powerful than we think, and until manufacturers and retailers have ethical standards baked into their best working practices, it's our job as informed consumers to keep them on track, and the pace of change on schedule. Read more about the 2011 Ethical Consumer's report on their website. I talk a lot on this blog about the way technology and the internet is transforming the marketplace, bringing small artisan communities closer to customers across the world. This is as true in Western Kerala as it is in West Wales, the home of Monkstone Knitwear. Designer Anna Felton is working with her boyfriend, Richard Reed to create a new range of high quality woollen clothing and accessories on a lovely part of the Pembrokeshire coastline. Richard runs Trevayne, the family sheep farm, and has used the opportunity to develop sustainable methods of permaculture, enhancing biodiversity in the valley he and his flock call home. Anna's designs are informed by the yarns she can get hold of each year, which include fleeces donated from local farmers. She's careful to credit the farmers who help her out with wool from Welsh Black Mountain, Coloured Dorset and Natural Dorset breeds, and Monkstone uses local shearers, spinners and hand knitters to help create the pieces. The clothes are beautifully textured and detailed, and the insistence by Anna and Richard of keeping their community at the forefront of what they do means that the garments have a real sense of place. Grounded and gorgeous, Monkstone Kniitwear shows that sometimes you don't have to stray far from home to find the best. In fact, you don't have to shift your bum off the sofa. Everything Monkstone make is available in their online shop. But if you do fancy seeing what else the region has to offer, they even have camping facilities. How about that for getting up close with your suppliers? No matter how much I dig my heels in and howl, winter and the "festive" season approaches at speed. The evening and in some cases the morning commute are done in darkness now. It's not surprising that this is the season of parties - you need something to keep your mind off the cold bleak weather outside. Pier32, as ever, have your best interests at heart. We've got a wide range of winter jackets that will help to keep you as snug as an insect in a carpet (or something like that). From foldaway showerproof tops to full-on skiwear, we can do the lot. And as we offer clothing from award-winning ethical manufacturers like Continental and Starworld, you can be sure that you're buying and wearing cold-weather wear that's certified to be good for everyone. While you're at it, why not take a look at our range of high-visibility wear, which includes a jacket made from 25% recycled materials. A neat way to stand out from the crowd in all kinds of ways. Of course, if you subscribed to our newsletter, you'd know all this already, although Guru Ian's hard work does help me to lash together a blog post when I'm feeling a bit lazy. You can subscribe at the Pier32 Website. Sustainable clothing is a beautiful thing. But unless you're going to do the tremendously ungreen thing of wearing it once and then chucking it (unless you're into single-use paper overalls, of course - that's you're choice, and potentially a great idea for closed-loop clothing) at some point those clothes are going to need washing. Sooner rather than later, if I'm any guide. Hey, I'm an active boy. I'm assuming that you aren't taking your organic cotton down to the river and bashing the dirt out with a rock. Which means there's a problem. Modern cleaning solutions are, bluntly, a drain on resources and a big worry for the environment. It's been known since the seventies that detergents have pretty harsh aftereffects on aquatic ecosystems. And of course, washing machines and dryers are notorious power hogs. But we're starting to see a major shift in the way the big brands deal with this problem. Taking their cue from pioneering brands like Ecover, household names like Unilever and Ariel are working hard to (sorry) clean up their act. Persil's Small And Mighty uses a concentrated formula, and in doing so has cut packaging and transport costs in half, as well as putting less waste surfactant and detergent back into the ecosystem. Ariel, meanwhile, have innovated with products that do the job at significantly lower temperatures than before, as low as 15 degrees. New eco-brands like Method, meanwhile, have developed bottles that only distribute the right amount of product, again cutting down on waste and nasty by-products. But there's still a long way to go. Many older washing machines simply can't wash at 15 degrees, and the idea of buying new has to be balanced against how much more efficient this new tech is going to be. There is still plenty we as consumers can do - the simplest being to start drying clothes on lines again as opposed to in a tumble. New textiles designed to repel dirt and odours could be another step forward. As ever, it's innovative thinking and smarter use of technology that will ensure that in the future, when we clean our clothes, we're not muddying the waters. For more, read Peter Madden's article in The Guardian. When we talk about markets in the digital world, we sometimes forget the literal sense of the word. The vibrancy and colour of the souks of Morocco isn't something that easily translates to the Internet. While Beldi can't quite do that (and as the world's worst haggler, I'm a little relieved) this new start-up is committed to bringing the best that the artisans of Morocco have to offer to a worldwide market. Beldi are dedicated to keeping the craftsman's traditional skills alive, highlighting houseware and, more importantly for the remit of this blog, stylish leather accessories and jewellery. Beldi are no crowd of corporate hawks swooping in and strip-mining the markets either. They're a husband and wife team, and co-founder Chafiq Ennaoui grew up in the souks. He understands the slow negotiations that typify the way business is done, and knows many of his suppliers from childhood. Working with the craftsmen of the souk brings their beautifully crafted wares to a global audience, who may never see this stuff or would be too intimidated to bargain for it in the traditional way. Sustainability, support for local artisans and goodies at a fair price. Sounds like a win-win to me. Immerse yourself in Beldi's world at their website. In the latest edition of the Pier32 newsletter, we talk about the work we've done over the spring and summer with Wildlife Trusts. Many of the 47 Trusts up and down the country have benefitted from the t-shirts, fleeces and hats we've supplied in both generic and more site-specific designs. Around a dozen Trusts chose to use their own text or logo designs, while the rest enjoyed clothing made to the usual high standard you expect from Pier32. The shirts also got an airing on BBC's Naturewatch and Springwatch shows, making a nice change for Chris Packham from his usual esoteric taste in clothing. 14 designs in a huge range of colours and sizes have been successfully rolled out for Wildlife Trusts over the last few months. Development Guru Ian points out: "Through a combination of clever and flexible design together with some careful planning and thoughtful scheduling we were able to keep the costs down for Wildlife Trusts whilst providing a huge variety of individualisations." It's a great project to work on, and Wildlife Trusts have been delighted with the end result. Just another example of how Pier32 are happy to work with our clients to make sure sure their projects and promotions are a roaring success. This weekend saw something of a meetup for Pier 32. A social engagement brought me together with Ian Development Guru, Marketing Queen Sandi, Ali the Future Head Of The Company, and Gerry The Voice Of Pier 32. A fine time was had all round, and I was provided with a gift. Well, alright, I was handed said item as it was the wrong shape for Ian, but I'll take free clothing if it's offered. It was a pair of lounge trews and a hoodie from the Boxercraft range that I've extolled previously on this blog. Well, my goodness. They're rather nice. The cotton is soft and light, with a brushed finish that somehow avoids the shuddery nap of velvet (advisory: velvet and I do not get on. Icky stuff.) while still keeping a pleasingly luxuriant feel. The hoodie is slimmer fitting than outerwear, snug without being overpoweringly warm. MP3 cable management (JARGONBUSTER: a little hole in the pouch for your headphones to go up the inside of the top) keeps you tangle-free and sleek when you're rocking some tunage. The ensemble is casual and relaxed; perfect for lounging around updating Facebox on your WiiStation or whatever it is the kids do these days when they're not clogging up Twitter with annoying gibgab about X Factor. Gotta admit, I'm really happy with my Boxercraft clothing. It's quality comfywear, with a proper ethical pedigree. What's more, the cut is perfect for showing off my slim, athletic physique and my taut cyclist's thighs. You might think that a store encouraging its customers to buy less really had the wrong idea. But that's exactly what upscale outdoor clothing chain Patagonia are doing - and it might just be the smartest move they've ever made. They're teaming up with eBay, asking their customers to sell off their old Patagonia gear through a bespoke shop on their website. It's clever thinking. Patagonia have always pushed sustainability over profit. Their stuff is expensive and built to last. The used store enhances the brand's corporate philosophy and exclusivity. You don't bin this stuff. It has a life beyond one person's wardrobe. "Patagonia is extending its customer base and increasing it. People who are selling it are likely to turn around, take the money they got, and buy the new Patagonia products." This is not an approach that'll work for everyone. You need a certain quality of merchandise, a loyal fanbase and an understanding tranche of shareholders. But get it right, and the rewards are potentially massive. Persuading your customers to spend less could open a whole new profit stream. There's more on this at The Guardian. The Ethical Fashion Forum's Source Expo, the only trade show in the UK dedicated to ethical sourcing, kicked off yesterday, and it's already being hailed as a massive success. A wide range of seminars on areas like Latin America and India, and on subjects like the cotton industry have brought a community of like-minded designers and retailers together to air their grievances and share their ideas. The buzz is palpable and thrilling to behold. Strong themes are already starting to emerge. The importance of good communication with suppliers, especially in cross-cultural circumstances, and the need for a deep knowledge of the entire supply chain cropped up again and again. There were calls for organic cotton and fair-trade goods to be much more readily available on the high street. Brands that I've mentioned before in this blog, like innovative jeweller Caipora and organic shoemakers Veja were both held up as great examples of what can be achieved in a rapidly evolving market. The future of sustainability forum was the big draw, and there were some big ideas to match. Bridging the gap between the luxury industry and sustainable supply was raised as a great way to bring things forward. It's important that ethical clothing should be regarded as beautiful and lust-worthy, not just worthy. Even in a recession, people will buy beautiful products, especially if they're seen as an investment - and that investment can be towards the planet and it's people as well as your wardrobe. The call was clear: "it's not just sustainable ethics, it's sustainable aesthetics!" Source Expo continues today at Sadler's Wells. if you can't make it and you want a flavour of the event, check out @EthicalFashionF on Twitter for the live stream of fora and happenings. The ideas and enthusiasm bubbling out of the expo are thought-provoking and intoxicating in equal measure. We don't see much of American Eagle clothing in the UK, but congratulations from the Pier to them for their new recycling initiative. Until October 18th, the chain are inviting customers to bring any piece of denim from any brand into their stores to be down cycled into insulation and given to communities in need. As a reward, there's a 20% discount on all American Eagle clothes on offer. It would be nice to see this initiative run for a bit longer, but as a gentle intro to cradle-to-cradle thinking, this can't be faulted. Especially considering that the chain have 850 stores across the country, and a presence in 47 college campuses. Read more about the initiative at the website of Cotton Inc, the recycling partner of American Eagle. Our friends at the Ethical Fashion Forum have a lot to be excited about. Next week sees Source Expo, the only UK trade show dedicated to ethical sourcing, arrive at Sadler's Wells for it's third year. The show has gone from strength to strength since it's launch in 2009, and this year promises to build massively on the groundswell of support for ethical fashion - a groundswell that the EFF has done an awful lot to ferment. As well as a wide range of exhibitors, a special pavilion will showcase work from designers that have shown themselves to be innovative in the way they source and manufacture their clothes. The EFF also go out of their way to offer space to designers who'd otherwise struggle to access a platform for their work - a vital stop for those of us interested in the cutting edge of sustainable fashion. With seminars and product displays highlighting the dizzying range of ethical fashion options, Source Expo is going to be one you can't miss. It's on next Monday and Tuesday at Sadler's Wells, in London's fashionable Covent Garden. For more info and to snag tickets, check out the Source Expo website. Welp, looks like autumn is finally with us, or if not it's just texted to say it's on the bus, round the corner and can we get it a pint. Which means I can finally start focussing on autumn clothes. These little beauties, the Francesina Alta boots from Italian designer Forest Of Gingko, are giving off the right "tramping through piles of leaves in the forest" vibe. Made from vegetable-tanned, chemical free leather sourced from animals that have died naturally, they boast a casual modern chic that's somehow timeless. They're robust enough to wear through the season, and the double-stiched soles can easily be replaced - making these a sustainable investment that'll last you for years. None of which makes them cheap, of course. You'll be looking at the €500 mark for a pair. You can check out the Francesina Alta, and other shoes in the collection, at SlamJam. Looks like cradle-to-cradle or closed-loop systems are going to be a bigger deal than I thought, and emerge much more quickly. Wayne Hemingway, founder of Red Or Dead, is running a new company dedicated to corporate upcycling, Worn Again. They already have contracts with Eurostar and the Royal Mail, providing bags made from old uniforms. In a ground-breaking move, Hemingway and his team have been given a free hand to design a fully recyclable uniform for McDonald's 85,000 staff members. Mickey D claims to be the first company in the UK to commit to a closed-loop system for corporate clothing, as part of a massive effort to green up their image. The new uniforms will be rolled out in time for the Olympics, launching at four sites in the Olympic Park before rolling out across the company's 1200 restaurants. This is clearly a big deal for the future of cradle-to-cradle thinking. If a company as big and ugly as McDonalds can see the benefits, then we could be on the cusp of a paradigm shift. Sustainable thinking becoming the norm, a practical business decision rather than a PR exercise. I'm afraid I'm going to get a bit theoretical on you this morning. I want to talk about a phrase that's becoming one of the core ideas behind sustainable industry - the concept of Cradle To Cradle. The idea is pretty simple, and familiar to most of us. It takes the industrial process (in which you source materials and make products from them using manufacturing techniques) and maps it onto the way things work in the natural world. Materials are viewed as nutrients. Manufacturing becomes a metabolism which is fuelled and sustained by these nutrients. The goal is to create closed loops, where the materials and processes used can be fed back into the system, as recycled products or nutrients. Of course, for this to work the materials have to be high quality, and unlikely to cause damage to the system as a whole. In cradle-to-cradle, toxic waste is a no-no. Let's think about shoes, as an example of what I'm talking about. Say a nice looking Converse-style trainer. Not that I'm obsessed with nice looking Converse-style trainers or anything like that. In a cradle-to-cradle factory, shoes would be made using materials that can either be recycled or reused. The manufacturing process would take rubber offcuts that would normally be thrown away and use them to make more soles for the shoes. In a more extreme version of the model, you would not buy the shoe: you would effectively rent it for a fraction of the cost of buying it outright. Once it's worn out, you would simply return the shoe to the manufacturer, where it would be taken apart and it's materials rolled back into the closed loop. Taking the example of the Oat Shoe that I've discussed previously, you would plant the shoe once you're done with it, returning it to the environment with the added benefit of flowers growing out of the seeds that were embedded in the sole. There's no reason those seeds couldn't be food crops, either. Plant a shoe, get a salad. Or look at an example that Pier 32 offers: the fleece made from shredded plastic drinks bottles. Returning waste into the system in an innovative and profitable way is at the core of cradle-to-cradle thinking. None of this is particularly ground-breaking. But taking the ideas and principles that make sustainability work and putting them into a proper theoretical framework allows users at every point in the supply chain, from supplier to manufacturer to customer, to examine the work flow in an informed way and be able to suggest changes. The closed loop is always open to new ideas. You can read more than you ever thought you needed to know about cradle-to-cradle at it's Wikipedia page. It's been a busy, buzzy couple of weeks for UK fashion. London Fashion Week has been a big success, and the launch of Westfield Stratford has given us the unlikely sight of fashionistas flocking to one of the grimmer corners of East London. But, as the Ecologist makes clear in a recent article, there's a ghost at the party. Sourcing clothes ethically and at a good price is a tough balance. According to Dutch corporate investors SOMO in a report published in May, that balance is teetering in a very dark direction indeed. Bonded labour has been an unpleasant reality in the marketplace for centuries. It's tantamount to slavery. In India, the practice is known as 'sumangali'. Girls as young as 14 are signed to three-year contracts, offered free accommodation and pay, with a lump sum payment to be made at the end. It seems an attractive prospect, especially for families that are looking to build enough money for a dowry payment. The reality isn't so rosy. For the duration of that time, the girls effectively belong to the factory. They live in dormitories with no freedom or privacy, offered no benefits and are forced to work unpaid overtime. If they quit before the contract is up, then they forfeit the final payment. According to SOMO, retailers like Tesco, H&M and Next all use factories that have workers under sumangali contracts. Fortunately, all three have signed pledges condemning the practice and are working with NGO's to get a three year plan under way to bring the practice to an end. But progress is likely to be slow and involve delicate negotiations. Sumangali is ingrained into the Indian way of work, and the SOMO report admits that any company doing business there is likely to indirectly source from suppliers that use the practice. Simply walking away from India helps no-one, least of all the girls at the bottom of the stack who most need the money. None of which makes for particularly uplifting reading, I know. But even if it does take years to eliminate, or at least marginalise an exploitative practice that's been going for centuries, it's worth the effort. The Ecologist: UK retailers struggle with bonded girl labour in India. How cool are these shirts? Supplied by Pier 32 for Studio 3 Arts, the three bold colours and glorious retro typefaces are enough to tickle this blogger's WANT nodes. Studio 3 Arts are an issue-driven arts organisation based around East London and the Essex borderlands, helping to get local people involved in high quality arts projects. Their mission? "Our aim is to use creativity to build communities. By encouraging existing interest in arts, and offering new creative experiences, we hope to improve individual lives, reduce social exclusion, and help to build stronger communities. Our mission is to make art available to everyone. We encourage people to explore artforms they know and enjoy, and enable them to try new, untried ones. This process allows us to discover new, emerging artists and make art happen in unexpected places." That's a seriously laudable aim, and Pier 32 is proud to be involved. The T-shirts are a tenner a pop, and available now from the Studio 3 Arts website. Why not snag the set? Learn More About Studio 3 Arts! So I had a rummage in the hinterlands of my wardrobe. The dark, forbidding outland ranges, half a step from Narnia. And on the very last hanger before I found myself shaking hands with Mr. Tumnus, I found a black Levi's red-tab denim jacket. I hadn't worn it in years. It stlll fits perfectly, and is at just the right level of wear and softness to become a regular part of my winter wardrobe. Teamed either with a hoodie or a thick jumper, it'll do the job nicely as the temperature drops. I love the sturdy, hard-wearing feel of the thing, and the pockets are not measly afterthoughts. In fact, there are four decent sized inner pockets, the larger of which are a perfect fit for a Kindle. In one of the smaller ones, I found a good pair of shades that I thought I'd lost forever, and a pound coin. Double bonus. In short, this jacket has somehow evolved to suit me perfectly for the winter of 2011. A change of look for zero cost. Nice one. There's an idea then. Why don't you all have a rummage in your wardrobes this weekend, and see if you can reacquaint yourself with an old friend. You could be in for a very pleasant surprise. As London Fashion Week winds down, I think we can see that ethical thinking is becoming more and more important in the industry. Esthetica has celebrated it's fifth birthday in style, with a ton of media interest. The pressure clearly needs to be kept on a high boil. A new book by author Safia Minney, Naked Fashion: The New Sustainable Fashion Revolution highlights the massive changes that are underway, and what else we need to do. The tone is upbeat, while not stinting on the harsh, cruel realities that go into feeding our hunger for cheap clothes. The statistics make for a horrifying read. 1.5 million tonnes of unwanted clothes and textiles end up in landfill every year. A lot of the fashion that ends up at the tip does so unworn - a victim of the endless chase for the new thing, this season's look. Safia makes two key recommendations in her book, both of which seem perfectly, almost laughably reasonable. Spend a little less, spend a little more. The key to sustainability is to buy less often, but on slightly more expensive key pieces that will last you for longer. This is an approach that Pier Crush Vivienne Westwood has long championed, and who are we to argue with her? We will always want cheap clothes, but the cost is higher than we think. Workers in the third-world countries where these clothes are put together struggle to make ends meet, and a tiny increase in the price tag of many items - less than a quid - would guarantee a proper wage for them. That doesn't seem like much to ask to me. This book is an essential read if you're interested in how fashion moves forward into the 21st century. Naked Fashion highlights the issues, the problems, and more importantly the simple solutions that we can all implement with barely a thought to make the world of fashion just that little bit more fabulous. Naked Fashion is available now from Amazon. We're in the throes of London Fashion Week, and I thought we should have a quick peek at some of the more interesting collections coming out of Estethica, the ethical stream of the whole event. The big buzz on Twitter is all about Emesha, who used the week to announce a collaboration with fashion illustrator Lisa Stannard. The new print collection uses Lisa's designs and textures in a series of boldly androgynous clothes in silk - a natural fabric which naturally biodegrades at the end of it's life cycle. Ada Zanditon, a rising star in eco-fashion circles, is knocking the ball out of the park with her new collection. Her show, "Poseisus", takes influences from the sea and retweaks them for the urban environment. The clothes are layered, strongly coloured with shots of citrus orange and coral pink, and delightfully floaty. Cleverly, she's working with Ecover, helping to highlight the damage that cleaning detergents can do to delicate marine ecosystems, and the simple things we can do to help solve the problem. Make no mistake, Ada is high-end fashion, with a degree from the London College Of Fashion and an apprenticeship with Alexander McQueen. But her clothes are cutting edge in every sense of the word - her approach is eco-friendly from sourcing materials to the construction of the garments. No fashionista would be complete without a cavernous bag, and this season's eco-choice is likely to be from Lost Property. They're showing a fantastic range of totes that have been upcycled from hessian coffee bags. Tactile, roomy and fancied up with leather grips and detailing, these are going to be a must for the clothes pony with a conscience - or anyone that digs stylish individualism in their everyday carry. There's loads more on offer. Esthetica runs until Thursday at Somerset House on the Strand. I mentioned our range of hoodies, zoodies and mid-weight jackets last week while grumbling about the weather - which doesn't really seem to have improved much. But it's still desperately changeable out there. I struggle at this time of year to find the right weight of outerwear, especially as I cycle partway to and from work. It can be freezing in the morning, and warm with hazy sunshine on the trip home. What's a boy to do? I like this Okarma fleece, part of a range that has been made entirely out of recycled plastic bottles. It takes 44 bottles to make one jacket. That's a lot of pop. The end result is warm without being overpowering, light without letting the early morning breeze scour through it like water through a colander. I don't do cycling wear, and this seems like the perfect compromise. Plus it's ideal for puttering around the garden doing those jobs that seem to pile up at this time of year. According to the Soil Association (and who are we to argue with that august body?) this month is Organic September. They're highlighting all kinds of initiatives to get us to think and consume in a more organic manner. More importantly for the purposes of this here blog, they will be exhibiting for the first time at London Fashion Week. Estethica, the ethical exhibition running parallel to the main show will feature a Soil Association stand, co-designed by Telegraph style guru Tamsin Blanchard. They will be featuring brands like Continental Clothing, a Pier 32 favourite. Estethica is a internationally recognised ethical designer showcase, leading the way in celebrating the best in responsible fashion. Over 20 brands will be exhibiting this year, all of which meet tough ethical criteria combined with design excellence. Estethica starts this Friday 16th Spetember, at the Embankment Galleries at Somerset House on the Strand. 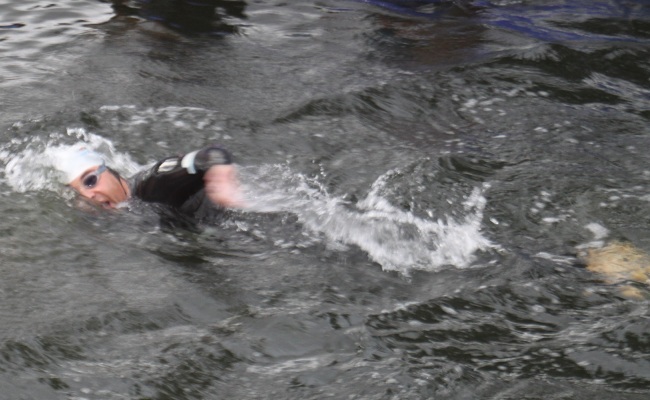 Most of you will already have heard all about David Walliams and his fundraising swim along 140 miles of the River Thames from Gloucestershire to London. However, as The View From The Pier can be read all over the globe and some of you may not have even heard of London, more details can be found at the Sport Relief website. This particular article simply focuses on the bit where David swam by just a few feet from the Pier32 windows, meaning I wanted to come into the office on a Sunday to get my very own close-up glimpse of a new national hero. We're very close to the Thames here at Pier32. In fact, we're on an island in the middle of it, somewhere between Hampton Court Palace and Kingston upon Thames. My young son, 9-year-old Alistair - who knows David as an author rather than as a comedian - was actually in the water in his wetsuit as David swam past and then followed him downstream for a few hundred yards, being towed by his mum in a kayak. Back to the fundraising, David and his team raised more than £1million in the eight days it took him to complete his journey, an amount nothing short of phenomenal that will make a huge difference to a lot of people. Hopefully, this will inspire many more people to get involved in charity fundraising. It could be argued that some will wonder whether their own efforts resulting in a couple of hundred pounds are still worthwhile, but they are, they really are. We work with many charities and all the funds they receive are needed. Now, those of you that follow Pier32 on Twitter will have seen references to our 'Riverside Meeting Room'. It's actually the pub at the end of the island. It's also where David stopped for a warm drink, a rest, and a massage on his way to Teddington Lock - his target for the day. 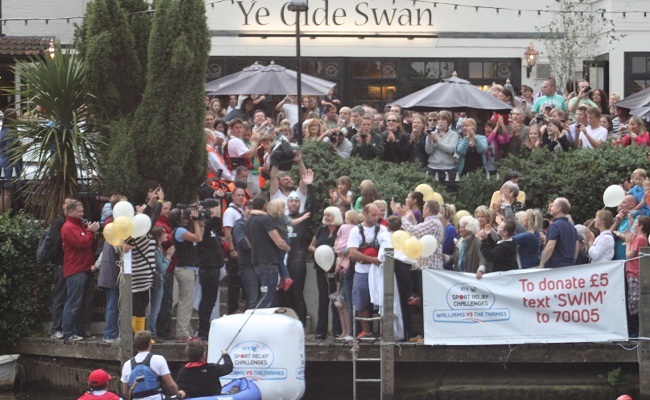 As you can see, an encouraging, welcoming and supportive crowd was there to greet him, including actor and comedian Peter Serafinowicz and actress Sarah Alexander. So, well done David Walliams. What an effort, what an achievement, what a man. And what about a knighthood? Yesterday, I pulled a warm coat out of storage. The sky was the colour of iron, and just as cold. To call this summer a damp squib would be an insult to moistened fireworks. It looks like autumn has come early, people. At Pier 32, we care about your well-being. We want you to be warm and snug when you poke your noses outside your front door. At the same time, it's not cold enough to warrant full-on winter wear. Never fear. We have your backs covered. Our range of hoodies, zoodies (hoodies with a zip, yeah, I know, it took me a minute as well) and soft-shell jackets are just the thing as the temperature drops. Warm yet light, packed with features like MP3 pockets and cable loops to keep your tunes close but out of sight, and available in great new contrasty colourways. You'll look the business and have no worries about staying cosy as the cold closes in. If you've subscribed to our newsletter, you know this already. Why not beat the blogger to all the latest from The Pier? When Hyun Jin Jeong talks about earth-coloured clothes, she's not kidding. The Central St. Martins student based her Master's thesis on the ancient and largely forgotten art of earth dyeing. Using soils from different regions, Hyun found that she could create colours of surprising vibrancy, from rich reds to buttery yellows. Troubled by the toxic legacy of chemical processes in the textile-dyeing industry, she took soil from areas ranging across the UK and her home region of South Korea, categorising them into different colour palattes and finding a method to apply soil-based paints directly to fabric. The results are delicately beautiful. "My vision of textile futures is the re-discovery of everyday materials from nature. There are many different natural materials that were once used but are now forgotten. I think rediscovering these materials and using them wisely is essential for a sustainable future." Read more about Hyun Jin Jeong on the Central St. Martin's Textile Futures blog, and on her own Earth Dyeing site. I'm excited. Can't you tell? It's been a long, slow year but at last September has come around, and with it comes British Wool Week. Don't roll your eyes. Yes, ok, wool, big wow. Sheep leavings. Made into jumpers and socks. Hardly bleeding edge fashion, is it? "Wool is one of the world's great natural fibres, famous for its versatility and comfort." "Wool is always my first choice because it's natural, it works, it's substantial; you can't do better than to use wool." Sadly, the industry has been in a slump for years, with farmers finding themselves unable to make a living from wool farming alone. Which is why Prince Charles launched the Campaign For Wool last year, a promotion that was such a success that it's evolved into Wool Week for 2011. A huge range of events is planned, including the launch of Wool Modern, featuring work from exciting new designers Like Fast and David Koma, alongside the lovely Ms. Westwood and the atelier of Alexander McQueen. See, look, wool and bleeding edge fashion. "We have continually tried to replicate what nature has provided us with but have never quite succeeded – and, indeed, why do we bother? The best already exists and is sustainable and friendly to both our environment and us." Events run all this week, and you can find out more below. It's important to support this most sustainable and British of fabrics at a time when its future has been thrown into doubt. Go on, show the love. No need to be sheepish*. *sorry. Best I could do. I'm feeling a bit wooly this morning. Good news for Continental Clothing, one of the brands that Pier32 are pleased to support and feature. Recent figures released by the Soil Association show that Continental are their fastest growing licensee. The company have doubled their product lines and had a twelvefold increase in accredited products in 2010. That's one heck of a jump, but it's not really a surprise. Their range is top quality, and demand is growing fast for their high fashion items. Pier32 stock a wide range of apparel from Continental. Why not check them them out? Another London-centric post today, I'm afraid. The South Bank Centre is hosting a Vintage Festival this weekend, featuring all kinds of retro shenanigans and celebrating cool music, clothes and collectibles from the 20s to the 80s. There's a marketplace for all your shopping needs, wants and lust-haves on the Hungerford Bridge Carpark, with over 250 stalls. But I'd like to point you at one in particular. Nancy Dee do vintage-styled design teamed with contemporary flair and impeccable ethical credentials. Their clothes are comfortable, affordable and look great. Obviously, second-hand wear is eco-friendly, but a lot of people don't like the idea of wearing pre-owned stuff. Nancy Dee get round that by producing beautifully styled retro gear that is made in a responsible way. OK, time to declare an interest. Nancy Dee is run by two sisters, Seraphina and Tamsin. I used to work with Tamsin back in the day. She's radically shifted career direction and I'm pleased to see her new business venture doing so well. I'm happy to trumpet the good word about the brand. If you're in the area, pop down and say hello. Nancy Dee can be found on Block 28 of the Vintage Village. If you can't make it to the South Bank, check out their web shop. If you happen to be in the King's Cross area tomorrow, The Hub on York Way has an event you may find of interest. It's hosting an informal talk with rainforest activist Beatriz (Bia) Saldanha. Moderated by ethical living correspondant for The Observer Lucy Siegle, the talk will focus on Bia's 25 years living in the heart of the Amazon, and her work defending the forest. The Rio de Janeiro native will be talking about the instability in the area, the threats to the ecosystem, and how her various campaigns and projects are tackling those problems. She has pioneered a new method of rubber production that supports the indigenous farmers and fights against deforestation. Her partnership with sneaker brand Veja has also had a positive effect. They buy direct from the rubber tappers, giving them higher revenue and nudging them away from widescale slash-and-burn techniques. Bia has won a ton of awards for her groundbreaking work in the Amazon, and this promises to be an enlightening evening. Tickets are free, but places are limited, so if you're interested you'd better get a move on. Further details from the Hub website here, or email contact.uk@veja.fr. It's all well and good to make the claim that your ethical clothing chain is supplied under carefully monitored conditions. But how can you, and more importantly your customers, be sure that those suppliers are doing everything they claim for the safety and well-being of their employees? Rachel Wilshaw of Oxfam, writing in The Guardian, has highlighted the problems of unscrupulous suppliers gaming their ethical audits. We're not just talking double-entry book-keeping. There have been examples of underground factories, staffed by an entirely different (and significantly underpaid) workforce, or of underage workers hustled out of the back door as the auditors come in the front. As more and more big companies insist on trumpeting their ethical credentials, the chances for corruption, or for a slapdash and lazy approach to compliance become greater. Auditors spend little time at the factories or farms, and an intimidated workforce is unlikely to speak out about unfair practices. Box-ticking and finger-wagging simply won't cut it. There needs to be a better way. A smarter approach, surely, would be for companies to work more closely with both the management and workers in their supply chain. Investment in more transparent management systems. Encouraging workers to bargain collectively for better pay and conditions. Offer the carrot of bigger contracts if a supplier can clearly demonstrate that they're working to code. Could an approach like that work? Well, global market leaders like Nike and Gap seem to think so. Companies with an established history of ethical trade programmes have found that this grown-up approach delivers real and beneficial results for everyone up and down the supply chain. Yet another example of how a clear, straightforward and ethical standpoint doesn't just make sense morally. It's good for business, too. Every year, the Ethical Fashion Forum holds it's InnovationUK Award, in which it recognises and celebrates a British designer or brand that has made outstanding progress in the ethical arena. As you can imagine, the quality of entrants is extremely high. The winners this year have just been announced, and the list is eclectic and rich with talent. A.L.A.S., winner of the Pure Spirit Award, make sleep and lounge wear from 100% organic cotton, which is sourced, spun, woven and dyed in India, using a local fairly paid workforce. Accessories Award winner Caipora's jewellery, made from reclaimed Brazillian hard woods inlaid with precious metals, is cleanly contemporary and compassionately stylish. But all the winners have one thing in common. Their ethical credentials are impeccable and the clothes and accessories look fantastic. The big push to get eco-friendly and Fairtrade goods out of the specialist market and onto the High Street had another nudge last week, as Marks and Spencer's CEO Mark Bolland outlined the chain's commitment to it's environmental approach. Plan A contributed £70million to M&S profits in 2010-11, nearly a third up on last year. Customers are buying more and more goods made from recycled, FSC-certified and Fairtrade materials. Over a million of them bought products that related in a direct charity donation, from ranges like the Fashion Target T-shirt for Breakthrough Breast cancer. M&S has also confirmed that 25% of their cotton will be coming from sustainable sources by 2015, going up to 50% by 2020. For a big hitter on the High Street to take ethical fashion and Fairtrade so seriously, and for their customers to embrace the end products so wholeheartedly, shows that big business is starting to see the benefits to a more sustainable, eco-friendly approach. And that has to be good news for all of us. With all the hoopla, furore and general whoop-te-doo surrounding the Murdochs, Sky and a newspaper industry that's looking more like a badly run spy network everyday, it's important to keep your eyes open for the other news announcements. The ones that get sneaked out while everyone's looking somewhere else. Even if they're not bad news, you have to wonder why the story has to come out at that moment. The latest example of this has been David Cameron's renewal of the Big Society pledge. This is the coalition's attempt to bring public services up to speed by allowing volunteer, charity and business interests to compete for their provision. Competition is, after all, a good thing, leading to more choice and value for money. Well, yes and no. I agree wholeheartedly that the volunteer and charity sector is vital to the well-being of the country. I'm completely behind the notion that communities should help each other out, that local knowledge trumps diktats from a remote central office. And I also believe that we can see when there is a need for community action, and are able to quickly unite to solve problems. We Brits are also a charitable bunch - look at what we do every year for Comic Relief, for urgent DEC fundraising efforts in places like the Sudan. Frankly, we already get The Big Society. The thing is, I'm not sure that Cameron and the coalition government do. Savage cuts to council funding have already started to bite the very groups on which this new strategy is supposed to depend. Across the country, these groups are scaling back services or are forced to close just at the point when they are being asked to take on a more frontline role. And that's the thing that worries me most. Charities and volunteer groups should enhance and complement, not replace existing local services. When councils decide to displace, for example, trained professional librarians with a squad of volunteers, there's clearly no understanding that it's a complex and labour-intensive job. It's not simply shelf-stacking, and you can't pick it up in an afternoon. Worse, what is supposed to happen in deprived areas where people simply can't afford the time to help out? "A vibrant, engaged community starts from an investment in infrastructure and skills, which can then be supplemented with a willing volunteer base. Cutting jobs for trained staff and hoping to fill the space with volunteers will not deliver a stable, long-term solution." I think that while there is nothing wrong in principle with The Big Society idea, there are big problems in the way it's being implemented and managed. And I also can't help but agree with critics who suspect at a time when local councils are having to cut budgets by 27% over four years, placing responsibility on local residents is just cover for cutting council services. When the budgets for the groups who are supposed to take up the slack are being cut as well, you have to wonder who's in charge, and what they think they're playing at.